Stamped decorative concrete is the process in which interior or exterior concrete can be be “stamped” to resemble a variety of different surfaces such: wood, brick, flagstone, stone, tile, cobblestone or a variety of different shapes and designs. Decorative stamped concrete can be an attractive and economical alternative to natural paving materials or plain poured concrete. Due to the durability and longevity of concrete, stamped concrete is a cost effective material to ensure long-lasting and beautiful surfaces for your home or business. Durability—concrete is one of the most durable building materials available. 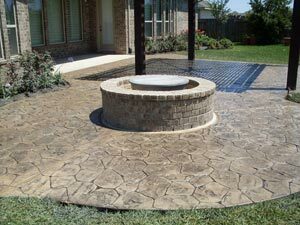 With proper installation and maintenance, your stamped concrete will last many decades. Optimal Radiant Heating—Slab or concrete topped based decorative stamped concrete are ideal use with radiant floor heating due to its excellent thermal conduction properties. Health—Decorative stamped concrete is a great alternative to carpeting for those individuals who suffer from allergies or who may be allergic to allergens that are many times found in flooring materials. It is exceptionally helpful with indoor pets. 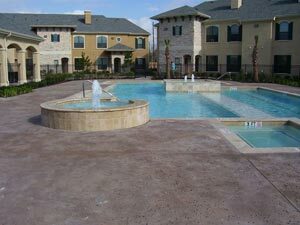 Cost—decorative stamped concrete are more cost effective when compared to wood, ceramic or quarry tile flooring when amortized over the lifetime of the floors surface. With the ability to imprint decorative designs combined with staining and sealing, decorative stamped concrete can resemble the most expensive marble, travertine and slate flooring. Craftsmanship—with the experts of Imprints in Concrete and their over three decades of concrete workmanship, your final result is guaranteed to be outstanding. With a virtually unlimited color palette and hundreds of different patter possibilities, every application is unique and can be customized to meet the desires of the property owner. In addition to being an aesthetically improvement to your new concrete structure, or a great restoration remodel, stamped concrete can add value as a safety feature. 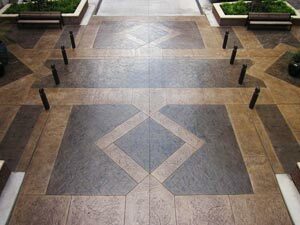 Adding pattern and texture to a walkway, patio, pool/hot tub area can improve traction. It is of great benefit in the event that the walking area is on an incline or downgrade making walking safer as well as great looking. Let Impression in Concrete, lay the ground work, literally for your large scale commercial concrete stamping project. Our experienced contractors attention to detail, engineering expertise, and extensive planning methods will be with you through the entire project from start to finish ensuring spectacular results. Impressions in Concrete will plan, engineer and install large scale commercial concrete stamping walkways, patios, driveways, showroom/sales floors, and sidewalks for business, schools/government buildings, restaurants, arenas, outdoor facilities and much more. Over three decades of professional commercial concrete stamping experience will provide that extra peace of mind you need, removing the stress associated with commercial projects. Stamped concrete is one of the best ways to improve concrete indoor and outdoor flooring. Whether you are pouring a new floor surface, or if your floor already exists, we can beautify your home or business with an elegant, easily maintained, and energy saving stamped concrete floor design that is customized to your desires. 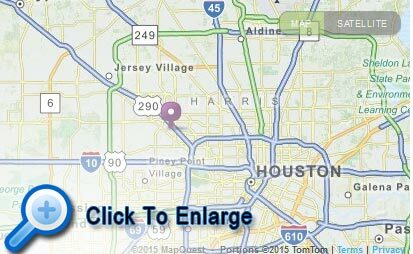 Fill out the information below, and one of our stamped concrete design experts will be in contact with you immediately, or call us at 713-682-8337 for immediate assistance. 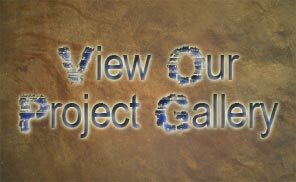 © All Rights Reserved, ® Impressions in Concrete, Inc.